Pierce: If it stands for “What Would Billy Joel Do?”, I’ll tell you right now, he’d write another crappy song. Troy: Yeah, in your face Billy Joel. Alas, Chevy Chase’s character of Pierce is misguided and poor Annie & Troy don’t know what they’re missing. Business Tip #5: Focus on your core strengths. Billy Joel’s strengths include his piano playing, songwriting, and ability to create characters in his songs (as in his signature Piano Man). 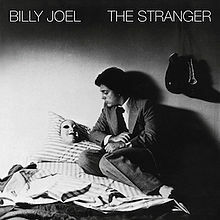 He played to his strengths nicely on The Stranger, an album full of stories and piano-driven classics. No shortage of gems here, including Movin’ Out (Anthony’s Song) and Only The Good Die Young. Scenes From an Italian Restaurant is Joel’s longest tune and also one of his more memorable. Though there are plenty of musicians on board, the best of the bunch here (She’s Always a Woman) is also likely the sparsest arrangement. This also lends some much needed credibility to my theory that truly great songs need very little accompaniment/overdubs, so thank you Billy Joel! When you do what you do best, good things tend to happen. Musically & commercially, things worked out pretty well for Billy Joel here.